Jumbo Shrimp Minor League team opened with a postgame concert on top of the first-base dugout at Family Faith Night at the Baseball Grounds near TIAA Stadium. Headlining outside of the dugout was Christian musical artist Rhett Walker Band. The highlight for the evening was Superheroes Night celebrating the superheroes of the health care field. Another highlight of the evening was a backpack giveaway. 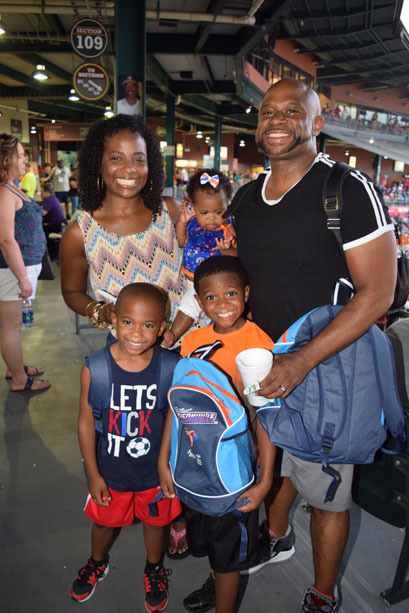 The first 2,000 kids through the gates received a free backpack. 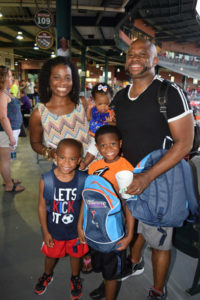 Family fun day is a day to make children feel like the pros before each home game, as families played catch on the field and had fun taking photos in the Jumbo Shrimp player autograph booth. Kids 12 and under enjoyed face painting and free balloon animals after running the bases. 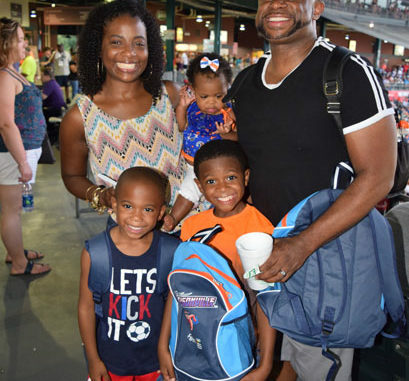 Shown with their book bags is the Bartley Family: Javier, La’Trece, Langston and Myles.